We have been out of our Mutants & Masterminds Gamemaster’s Kit for a while, but were recently able to fit a reprint into our schedule. We took this opportunity to upgrade this trendsetting GM’s Screen and accessories while we were at it. 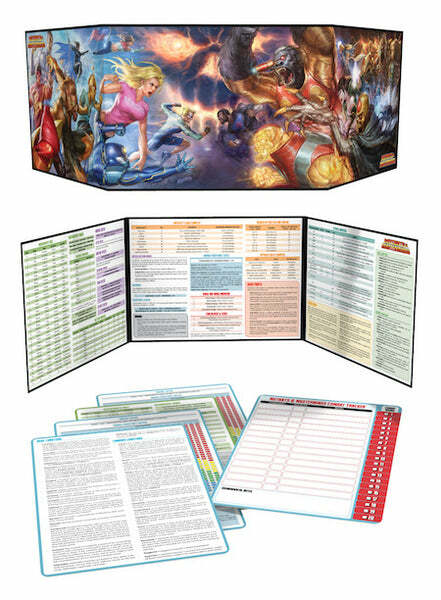 The Mutants & Masterminds Gamemaster’s Kit is a key accessory for your superhero campaign. It features a sturdy and practical 3-panel hardback screen with all the charts and tables you need to play the World’s Greatest Superhero RPG. The kit also includes 4 quick reference cards and a combat tracker that you can write on with wet or dry erase markers. The Mutants & Mastermind’s Gamemaster’s Kit is the perfect complement to the Deluxe Hero’s Handbook and will help you kick off your game with style. 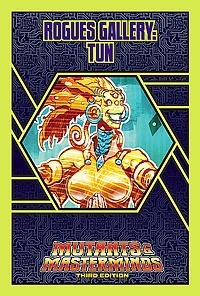 Speaking of the Mutants & Masterminds Deluxe Hero’s Handbook, it’s back in print! In case you missed the news and didn’t pre-order it, Cosmic Handbook is available now! And also for Mutants & Masterminds, we’ve got a new issue of Rogues Gallery for you! Tun is the Mistress of Ceremonies at the Game Station. She is responsible for entertaining the (once-)scientifically advanced race known as the Spigori. As they are now descended into lazy consumers of everything set in front of them, Tun is responsible for finding them new and exciting forms of entertainment. Sometimes that quest takes this powerful A.I. to other worlds, such as Earth-Prime! Written by Crystal Frasier and featuring at by Domenico Neziti.